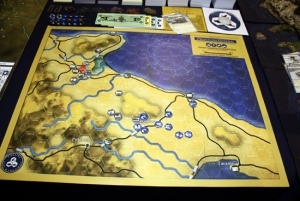 Italian Campaign Introduction introduces players to the Frontline General 'Land, Air, & Sea Tabletop Simulation', an Operational and Tactical Scale WWII Strategy System. The system covers Land, Air, and Sea wargaming mostly at the Operational level, but also allows detailed Combat Resolution at the Tactical Level using 3rd Party Miniatures (15mm Recommended) or the included Unit Markers. In this way, the Campaign may be used to 'drive' more detailed tabletop miniatures battles. 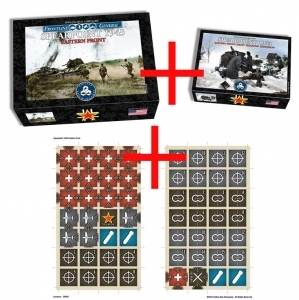 Miniatures battles expand on the game's normal Operational Scale combat by providing more terrain detail, 3D movement for Aircraft, Unit Facing, more detailed movement, line of sight, Morale rules, and more. Team Play Command rules allow up to 5 players per side to play against each other as teams that subdivide turn and command responsibilities between one 'Frontline General' and up to four subordinate 'Commanders'. Units such as Tanks, Vehicles, Emplacements, Aircraft, and Guns require crews. In this way, the 'men behind the machines' may gain experience and improve as the game progresses. They may also be destroyed or captured apart from the Units they crew. This allows interesting situations to occur such as capture of an enemy gun, crewing that Gun using your own crew, and then turning that Gun against the enemy. 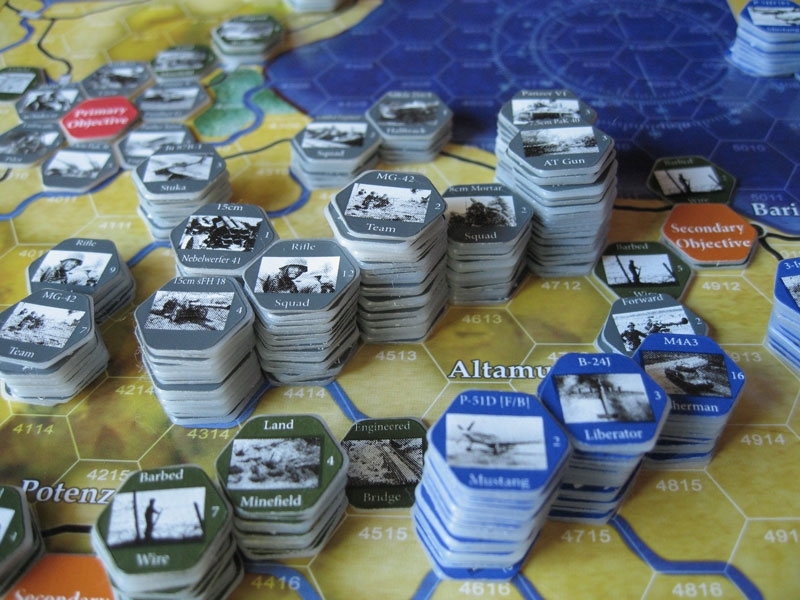 A basic Economic System charges players with choosing to procure an effective balance of Units for the objectives at hand. Players must also manage a very basic Supply system at the operational level to ensure Units remain fueled, fed, and supplied with adequate ammunition. 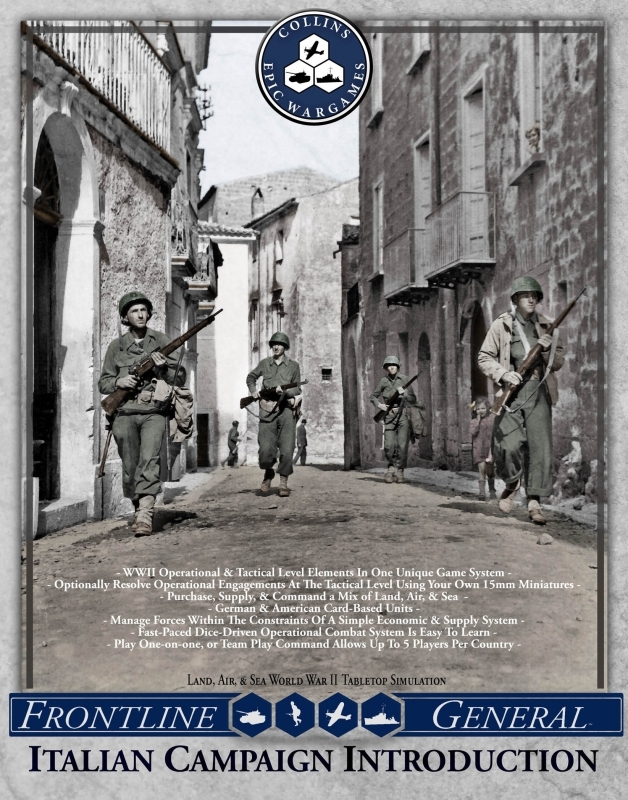 Frontline General: Italian Campaign Introduction is available in two forms - a Free print & play version to let you try out the game and preview the components - and a high quality production version. Campaign System for Miniatures - Drive Miniatures Battles with the boardgame. 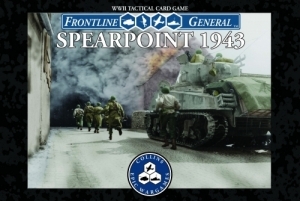 The Combat System of ICI is the inspiration for our bestselling Card Wargame, Frontline General: Spearpoint 1943. 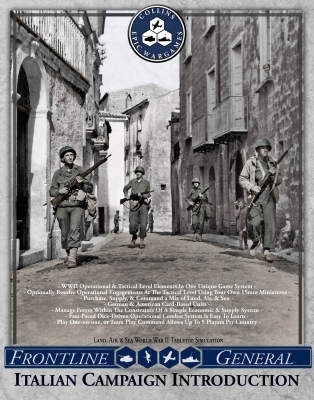 Full 60"x50" Southern Italy Map also available as a Print and Play Download (PDF) through Wargame Vault (direct link). 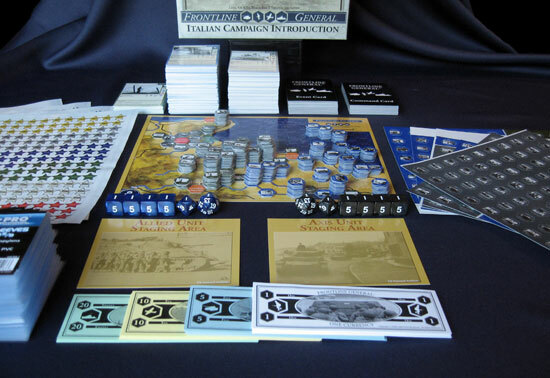 Frontline General: Italian Campaign Introduction is a campaign system for miniatures. This Deluxe Vinyl Map for the game provides larger hexes for more room for counters and fingers. The size is 22"x17".